Adolph "Dolph" Schayes (May 19, 1928 – December 10, 2015) was an American professional basketball player and coach in the National Basketball Association (NBA). A top scorer and rebounder, he was a 12-time NBA All-Star and a 12-time All-NBA selection. Schayes won an NBA championship with the Syracuse Nationals in 1955. He was named one of the 50 Greatest Players in NBA History and inducted into the Naismith Memorial Basketball Hall of Fame. Schayes was born in the Bronx, New York, the son of Tina (née Michel), a homemaker, and Carl Schayes, a truck driver for Consolidated Laundries. His parents were Romanian Jewish immigrants. He grew up on Davidson Avenue and 183rd Street, near Jerome Avenue in University Heights, Bronx. He attended Creston Junior High School 79 and DeWitt Clinton High School in the Bronx, New York, where he played for the basketball team and led it to a borough championship. He played his college basketball at New York University (NYU) in 1944–48. In 1945, as a 16-year-old freshman, Schayes helped NYU reach the NCAA final. Schayes earned an aeronautical engineering degree, was an All-American in basketball and won the Haggerty Award in his final year. His NYU coach, Howard Cann, said of him: "He was in the gym practicing every spare minute. We had to chase him out." Schayes was drafted by both the New York Knicks in the 1948 BAA draft (1st round; 4th pick overall), and by the Tri-Cities Blackhawks in the NBL draft. The Blackhawks traded his rights to the Syracuse Nationals, who then offered him a contract worth $7,500 (worth $74,000 today), 50% more than the Knicks, influencing his decision to go to Syracuse. Schayes played one season in the NBL and was named the league's Rookie of the Year. The following season (1949–50), the Nationals moved to the newly formed National Basketball Association as part of the merger between the BAA and NBL. Although tall for his era at 6' 7" (201 cm), Schayes was especially known for his deadly, high-arcing, outside set-shot. It arced so high that his teammates referred to it as "Sputnik". Defenders who attempted to deny him the outside shot were confronted by his powerful drive to the basket. These two offensive weapons served him well, even as the NBA was transitioning into a league of jump-shooters. Early in Schayes' career, he broke his right arm and played almost an entire season in a cast. Oddly, this injury became a seminal point in his development: he learned to shoot with his off-hand, making him especially difficult to guard. He was one of the best—and the last—to use a two-handed set-shot with feet planted on the floor, before the game changed to one-handed jump shots. In the 1949–50 season, he was 6th in the league in assists, with 259. He led the NBA in rebounding in 1950–51 (in which he also had 10 of the top 14 individual rebounding games), with 1,080 and a 16.4-per-game average. He was third in the league in rebounding in 1952–53, with 920. In 1953–54, his 12.3 rebounds per game were fourth-best in the NBA. In 1954–55, he led his team to the NBA championship. In 1956–57, he led the league in minutes-per-game (39.6) and free throws (625), while grabbing 1,008 rebounds (3rd in the league) and averaging 22.6 points per game (4th in the league). In 1957, he set an NBA consecutive free throw record in a single game with 18. In 1957–58 he again led the league in minutes-per-game (40.5), and averaged a career-high 24.9 points per game, second in the league, while averaging 14.2 rebounds per game (fourth in the NBA). Schayes led the NBA in free throw percentage three times: in 1958 (.904), 1960 (.892) and 1962 (.896). In 1959, he scored a career-high 50 points in a game against the Celtics. In the NBA, he didn't miss a single game from February 17, 1952 to December 26, 1961, an NBA-record streak of 706 games. In 1960–61, he again led the league in free throws (with 680). In 1961, he became the first player in NBA history to amass 30,000 career total PRA (Points + Rebounds + Assists). He was the first person in the NBA to ever surpass 15,000 points. A 12-time NBA All-Star, Schayes was a six-time All-NBA First Team honoree, and was also selected to the All-NBA Second Team six times. He came in second in MVP voting in 1958, and 5th in both 1956 and 1957. When he retired in 1964, he held the NBA records for games played (996), foul shots made (6,712), attempted (7,904), personal fouls (3,432) and was second to Bob Pettit in scoring (18,438) and third in rebounds (11,256). In 1970, he was elected to the NBA 25th Anniversary Team as one of the top 12 retired players. In 1996, he was selected as one of the 50 Greatest Players in NBA History. The 76ers retired his jersey on March 12, 2016 while the Syracuse Crunch retired it on March 26, 2016. When the Nationals moved to Philadelphia in 1963, Schayes was named player-coach of the Philadelphia 76ers. He retired as a player after the season, but stayed on as coach for three more seasons. He was named NBA Coach of the Year in 1966. From 1966 to 1970, he was the supervisor of NBA referees. He was named the first coach of the Buffalo Braves in 1970, but resigned one game into his second season. Schayes coached the US Maccabiah Games basketball team to an upset win to take the gold medal in the 1977 Maccabiah Games. He also coached the U.S. Masters basketball team at the 1993 Maccabiah Games. He also played an active role raising money for the Maccabiah Games. Schayes settled in Syracuse, New York in 1948, where he first played in the NBA, and where he was a real estate developer after his playing days. Schayes' son is retired NBA center Danny Schayes, who played for Jamesville-DeWitt High School, in DeWitt, New York; Syracuse University; and in the NBA for 18 seasons. His granddaughters Abi, Carla, and Rachel Goettsch won silver medals for the United States volleyball team at the 2001 Maccabiah Games, and his grandson Mickey Ferri won a gold medal in the 4 × 100 metres relay at the 2005 Maccabiah Games. In May 2015, Schayes was inducted into the Bronx Walk of Fame, where he received a street named in his honor, called "Dolph Schayes Street". Schayes died of cancer on December 10, 2015, at the age of 87. 1 2 Nino Frostino (2004). Right on the Numbers. Trafford Publishing. ISBN 1-4120-3305-5. Retrieved February 6, 2011. 1 2 3 4 5 6 Jewish sports legends: the International Jewish Hall of Fame. Brassey's. 2000. Retrieved February 6, 2011. 1 2 Salute to the Romanian Jews in America and Canada, 1850–2010. Retrieved February 6, 2011. ↑ Othello Harris, George Kirsch; Claire Nolte (April 2000). Encyclopedia of Ethnicity and Sports in the United States. Westport, Connecticut: Greenwood Publishing Group. p. 401. ISBN 0-313-29911-0. ↑ "The Depth of Ethnicity: Jewish Identity and Ideology in Interwar New York City" (PDF). Retrieved February 6, 2011. 1 2 3 Jewish Sports Stars: Athletic Heroes Past and Present. Retrieved February 6, 2011. 1 2 Tall Tales: The Glory Years of the NBA. Retrieved February 6, 2011. 1 2 3 4 5 6 7 "Dolph Schayes NBA & ABA Statistics". Basketball-Reference.com. Retrieved February 6, 2011. 1 2 "NBA.com Schayes Summary". Retrieved August 26, 2007. ↑ "NBL Rookie of the Year Award Winners". Basketball-Reference.com. Retrieved February 6, 2011. ↑ The Philadelphia 76ers. Retrieved February 6, 2011. ↑ Kiss 'Em Goodbye: An ESPN Treasury of Failed, Forgotten, and Departed Teams. Retrieved February 6, 2011. 1 2 3 Who's better, who's best in basketball? : Mr. Stats sets the record straight on the top 50 NBA players of all time. McGraw Hill. 2003. Retrieved February 6, 2011. 1 2 3 4 A Basketball Handbook. Retrieved February 6, 2011. 1 2 Smooth moves: juking, jamming, hooking & slamming: basketball's plays, players, action & style. 2003. Retrieved February 6, 2011. 1 2 3 Day by day in Jewish sports history. 2008. Retrieved February 6, 2011. 1 2 "Basketball-Reference.com: Dolph Schayes". Retrieved August 26, 2007. ↑ Hall of fame museums: a reference guide. Retrieved February 6, 2011. 1 2 3 4 Encyclopedia of ethnicity and sports in the United States. Greenwood Publishing Group. 2000. Retrieved February 6, 2011. ↑ Carlson, Chris. "Dolph Schayes will have his number retired by Philadelphia 76ers". Syracuse. Syracuse Media Group. Retrieved 12 March 2016. ↑ "Syracuse Crunch to retire jersey of Hall of Famer and 12-time NBA All-Star Dolph Schayes March 26". Syracuse Crunch. February 23, 2016. Retrieved March 3, 2016. ↑ The International Jewish Sports Hall of Fame. May 19, 1928. Retrieved February 6, 2011. 1 2 Ellis Island to Ebbets Field: Sport and the American Jewish Experience. Oxford University Press. Retrieved February 6, 2011. 1 2 Klein, Steve. "NBA Hall-of-Famer says games in Israel forged his Jewish identity". Haaretz. Retrieved February 6, 2011. ↑ "The Greatest – by Marc Tracy". Tablet Magazine. December 1, 2010. Retrieved February 6, 2011. ↑ Araton, Harvey (September 19, 2001). "Sports of The Times – Giving In Wasn't The Answer". The New York Times. Retrieved February 6, 2011. ↑ Goldin, Howard (May 18, 2015). "NBA Hall of Famer Adolph Schayes Inducted into the Bronx Walk of Fame". NY Sports Day. Retrieved June 10, 2015. 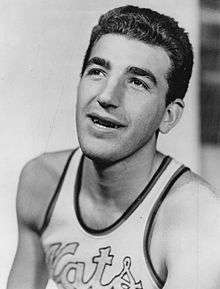 ↑ "Former Syracuse Nationals star Dolph Schayes dies at age 87". Syracuse.com. Wikimedia Commons has media related to Dolph Schayes.